I typically start from an existing MP3 file. It might be a CD I have ripped to MP3, or a soundtrack from DVDs or other sound bites. I also have a collection of accapella samples that are a nice source. 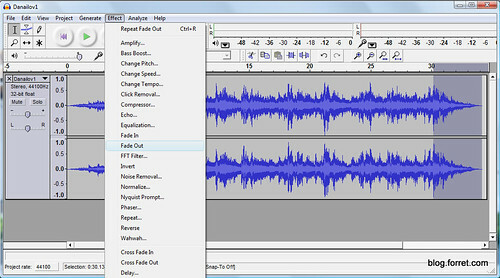 I use Audacity (with the LAME MP3 encoder add-on) to load the full source MP3 file, trim out the piece I want and then add a fade-in and fade-out. I prefer using the command-line ffmpeg for transcoding of audio and video. The simple way of doing it: ffmpeg -i ringtone.mp3 -y ringtone.m4a (.m4a stands for MPEG4 audio, ffmpeg will see this extension and use default settings for the conversion.) Afterwards you then have to change the extension to .m4r (MPEG4 ringtone). Just double-click the file, that should do it. but most of all: i’m glad you folded & are now an iPhone-owner. Thanks! This really helps! For anyone interested, you can reduce the number of steps by downloading the beta version of audacity, which can allow you to directly export into .m4a. This would make it as easy as choosing a file, cutting, export, and rename! I get lost at 4. with ffmpeg.. I can only gather that one has to have ffmpeg on their pc.. hmm and using run -> cmd – It looks like a great guide except I can’t make the leap to part 4. in your guide.